Initially launched as a four-door version of the Celica in 1979, the Camry became a stand-alone nameplate in 1982. Since then, it has evolved into one of the most reliable and popular sedans on the market, especially in the U.S., where Toyota has delivered more than 200,000 units a year since 1988 and in excess of 350,000 examples since 1996. 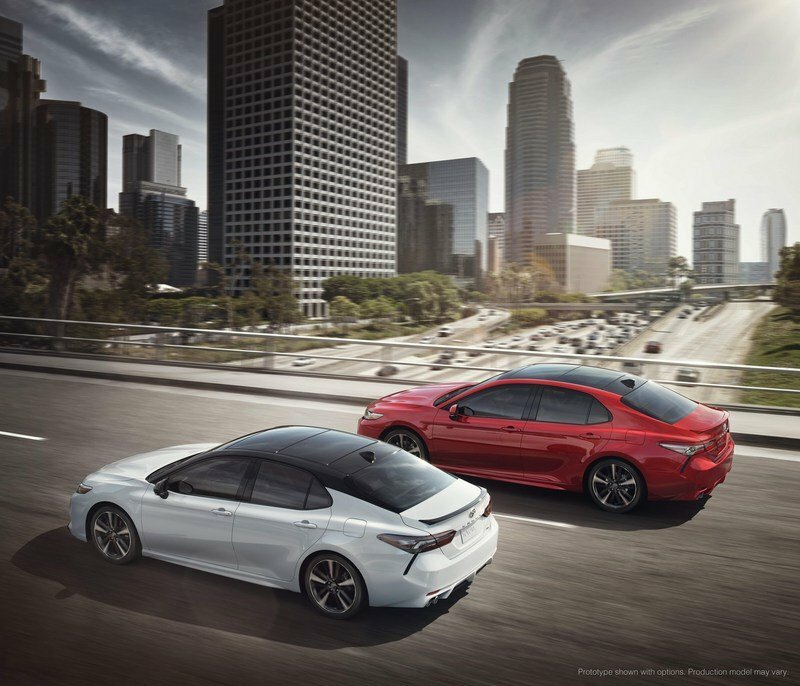 Currently the best-selling passenger car in North America, the Camry drove into a new generation for the 2018 model year. While almost all new-generation vehicles get redesigns both inside and out, the new Camry is a massive departure from its predecessor. Not only given a new look, it’s also sleeker, sportier, and more stylish than its predecessor. 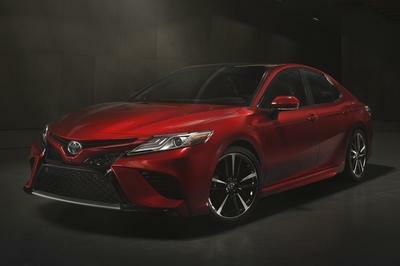 It looks as if the new Camry was created to bridge the gap between the dull Toyota cars and the premium Lexus offerings. And that’s not a bad idea. 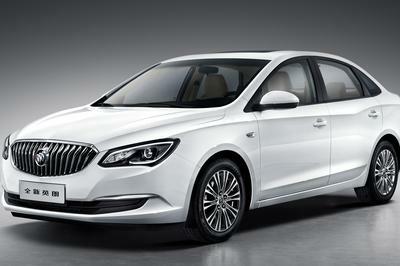 As usual, the redesigned exterior is jointed by a revamped interior with new styling and updated technology. Toyota also took care of the drivetrain department by introducing three new engines, including a hybrid. So how good is the new Camry? Let’s find out the answer to this big question in the review below. Update 6/21/2017: Toyota has announced pricing for the 2018 Toyota Camry, and the entry-level price increased by just $425. Check out the prices section below to learn all about it. When I first saw spy shots of the camouflaged Camry prototype, I was certain that the eighth-generation sedan will get an evolutionary design based on the outgoing car and combined with styling cues seen on the smaller Corolla. I can’t say I was wrong about the "evolutionary" part, but aside from some similarities with the previous model, the new Camry has plenty of new design features to brag about. What’s more, it benefits from a slightly different approach that combines a sportier stance with upmarket styling. In short, Toyota managed to free the Camry from its dull overall design. The first thing that catches the eye when looking at the new sedan is the firm wide stance that results from the low center of gravity. To achieve the latter, Toyota made the Camry wider, while lowering the engine hood by 1.6 inches and the roof by one inch. By contrast, the wheelbase is two inches longer. Toyota managed to free the Camry from its dull overall design. 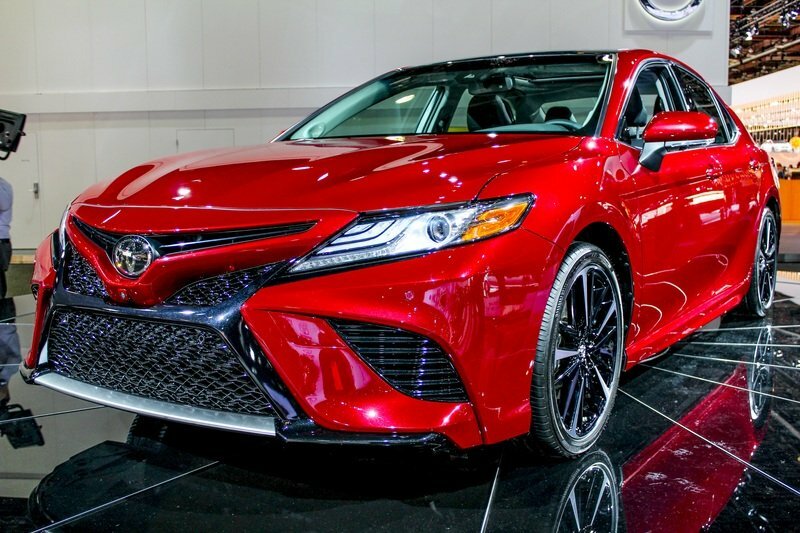 Moving over to what makes the new four-door more emotional and gives it a sporty and upscale image, Toyota used its Lexus brand as inspiration for the Camry. Up front, we can see more aggressive headlamps that are quite similar to those seen on the new Lexus LX, minus the lower LED strip that gives the latter a Z-shaped layout. 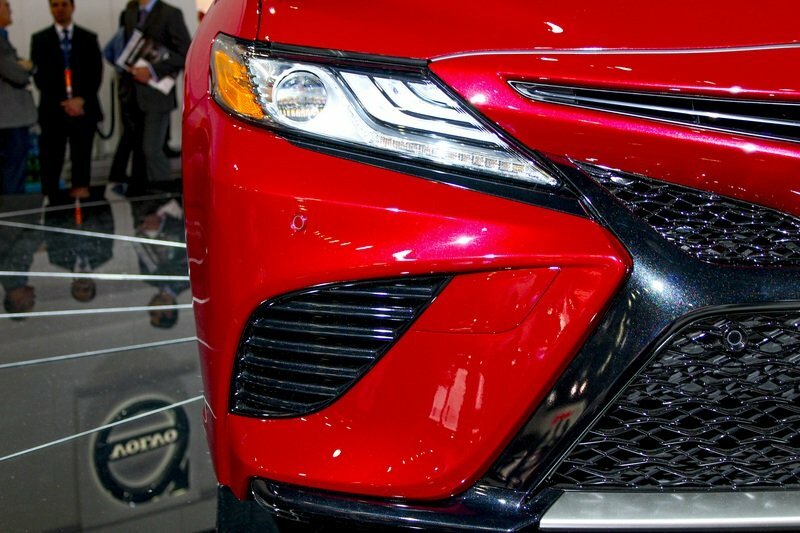 The grille is wider and larger, and even though it’s nowhere near as menacing as Lexus’ "Spindle" element, the lower section is sportier than ever before. The upper grille section and emblem are now framed in a body-colored element, while the side vents are significantly larger. The muscular lines of the new engine hood rounds up a front fascia that’s finally appealing to younger drivers, me included. 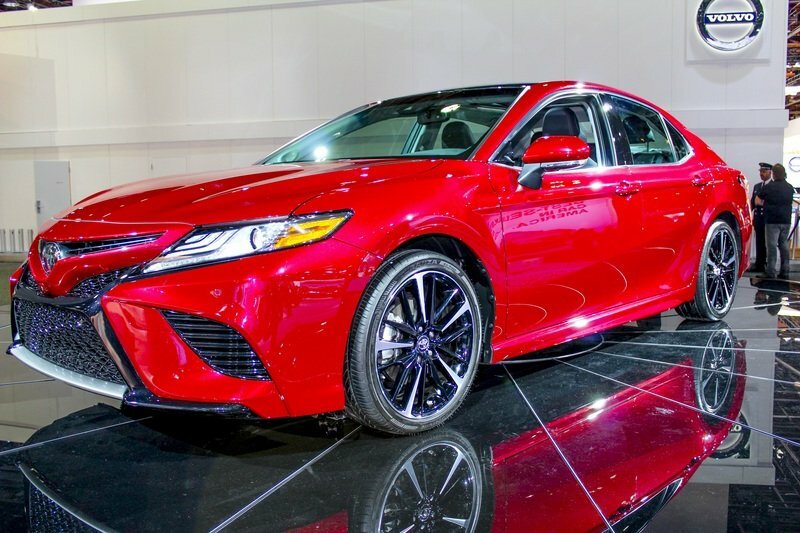 The two-tone rims and the black window trim gives it a decidedly sporty look you wouldn’t expect from a Camry. 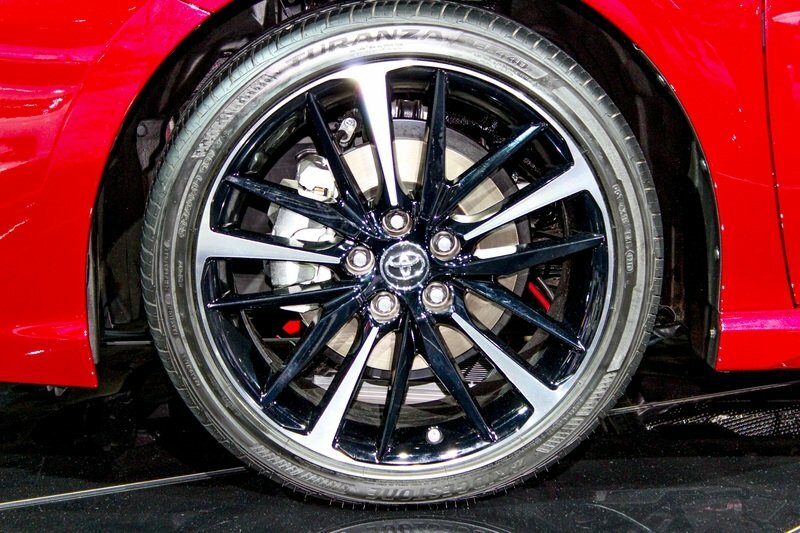 Moving onto the sides, Toyota ditched the simple beltline that ran undisturbed from the front fenders to the rear for a more exciting character line that highlights the beefier wheel arches. 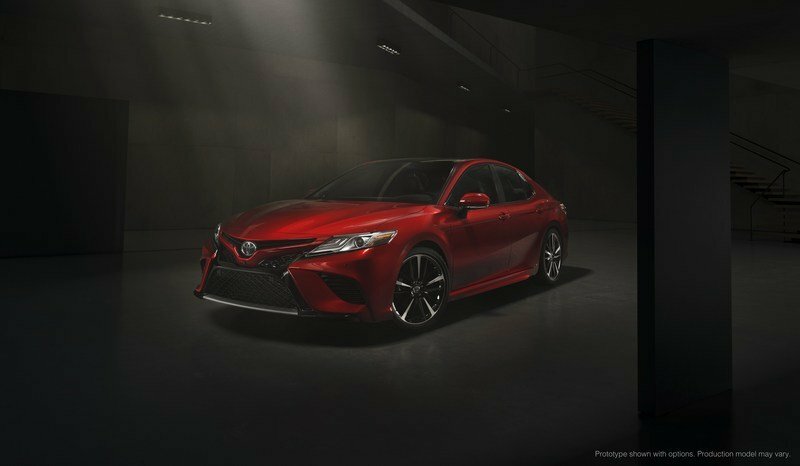 The two-tone rims and the black window trim seen one the red presentation model gives it a decidedly sporty look you wouldn’t expect from a Camry. Of course, these features only come standard on the more expensive trims and the lower versions will get more chrome, but I don’t see how a bit of bling would ruin the excellent proportions of the sedan. Around back we can see more features we don’t usually find on a Camry. 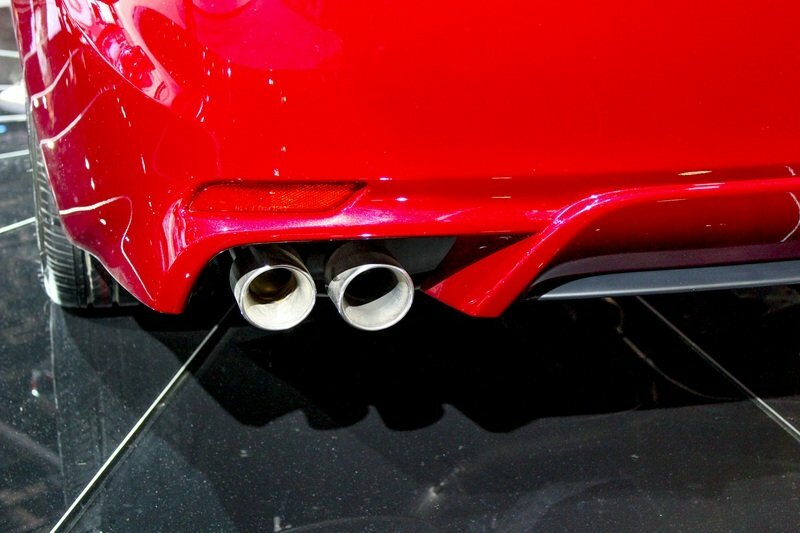 There’s the protruding spoiler atop the nicely sculpted trunk lid, the new taillights with vent extensions toward the apron, and the revised bumper with quad exhaust pipes and diffuser-like elements. 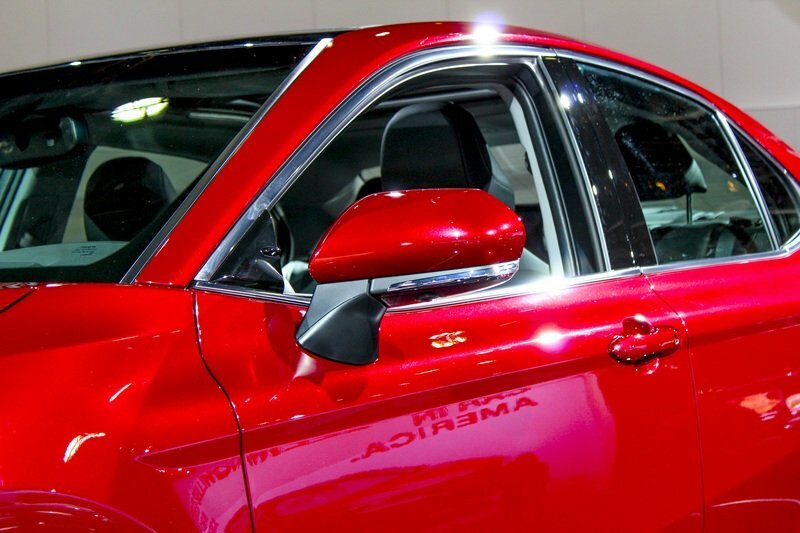 Also, a closer look at the C-pillar reveals a multitude of surfaces that reflect light from all angles. 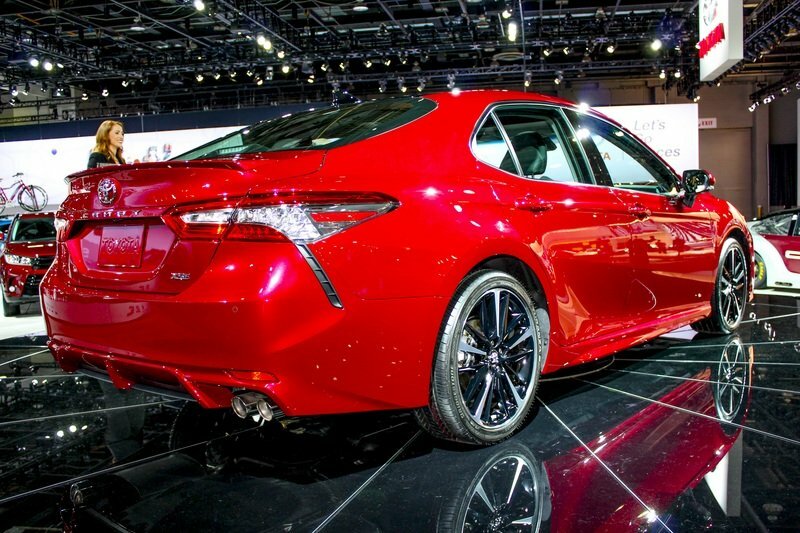 This is more proof that Toyota spent a lot of time designing the new Camry! The Honda Accord is the Camry’s main competitor and essentially the only midsize that threatens Toyota’s supermacy in this segment. Much like the Camry, the Accord (left) got a massive makeover in its latest generation. Introduced in 2015, the current Accord is sportier, more elegant, but also a bit larger for a more upscale look and roomier interior. 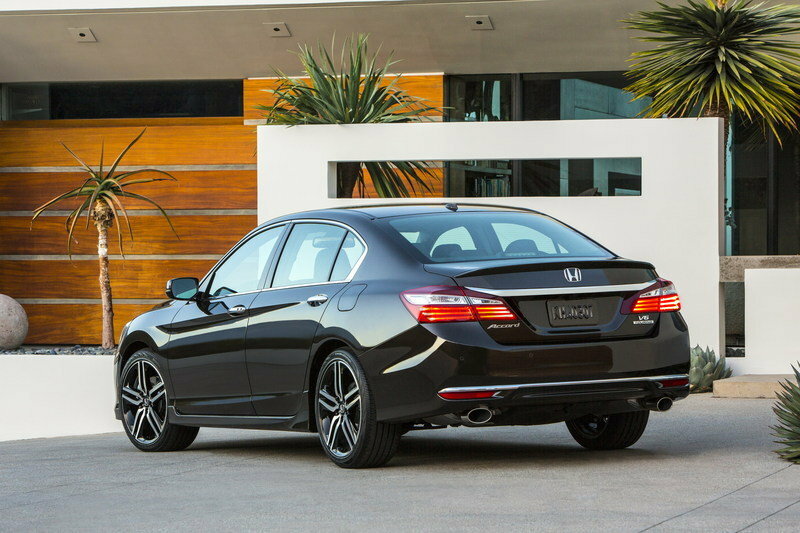 Honda also opted for a swoopy beltline instead of the plain and simple character line of the previous model, but the fenders aren’t as muscular as the Camry. Despite this, the Accord is a very appealing proposition thanks to its aggressive front design and stylish, coupe-like rear section. Although it’s around two years older, the Accord doesn’t feel dated compared to the Camry and will probably stand the test of time with help from a mid-cycle refresh. The Ford Fusion is yet another popular midsize, although sales are significantly behind the Camry and Accord. The Fusion (right) is also older than the two, having been launched for the 2013 model year. 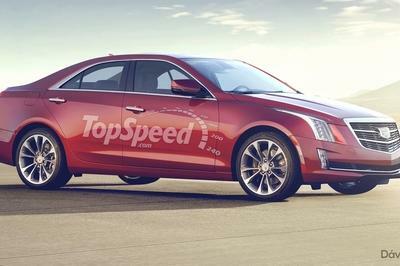 A facelift introduced for the 2017 model year injected new life in the sedan’s exterior design. Although not as sporty as its Japanese rivals, the Fusion is arguably the most elegant Ford on the market and the sweptback headlamps, big hexagonal grille and large taillights with the chrome strip between them give it a somewhat stately look typical to larger sedans. Being the older car, the Fusion will get an overhaul at some point, but don’t expect it to happen sooner than 2019. Note: 2017 Toyota Camry specifications listed here. 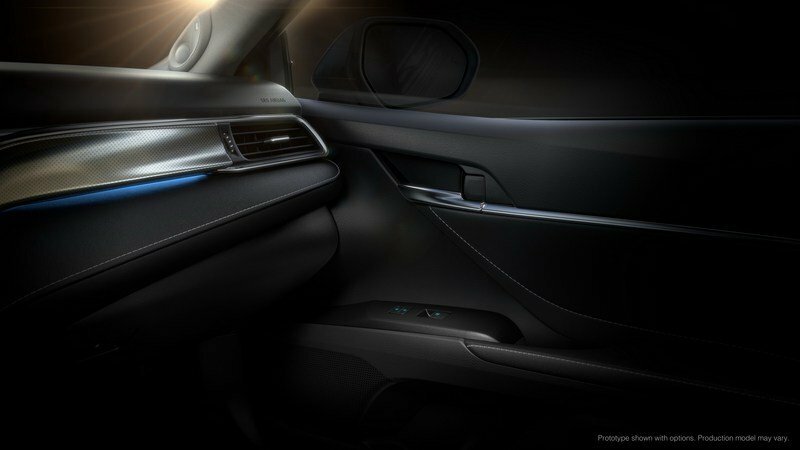 While the new exterior is sportier, fancier, yet evolutionary, the cabin is a massive departure from the previous design. 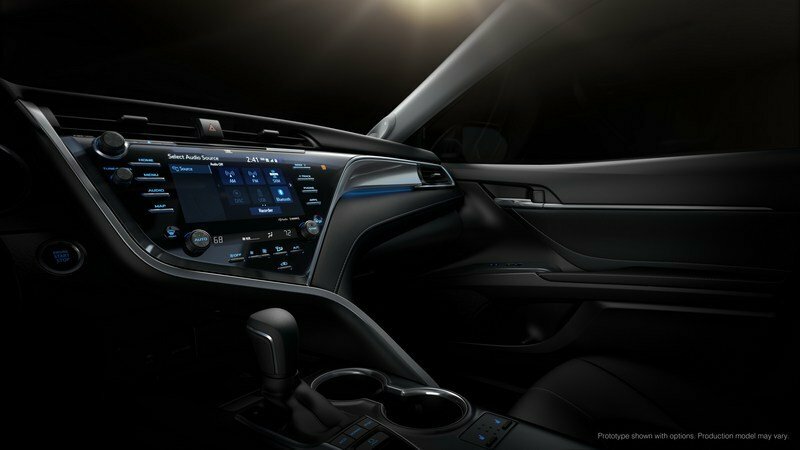 While the outgoing Camry’s interior is a collection of horizontal lines disturbed only by the center stack, the new sedan is a more organic proposition on the inside. The new dashboard, which feels modern and more upscale than before, was designed with two main things in mind. First, it’s supposed to give the driver the feeling that he’s actually sitting in a sports car. This is achieved through a cockpit-type compartment with the gauges and the center stack angled toward the driver. This is further aided by the unique character line that flows down from the instrument cluster and bisects the center console, thus isolating the gear shifter from the passenger side. Meanwhile, the passenger gets a different atmosphere, highlighted by a sense of openness and the soft-touch surfaces and the veneer in the dashboard. The cabin is a massive departure from the previous design. On top of this bipolar front compartment design, which I must say it’s pretty interesting in a Camry, Toyota promises that nearly all surfaces are made from the "highest grade of soft-touch and premium materials." Granted, the Japanese brand probably isn’t talking about the kind of materials you can in an expensive Mercedes-Benz, but it is trying to make a point that quality has gone up. 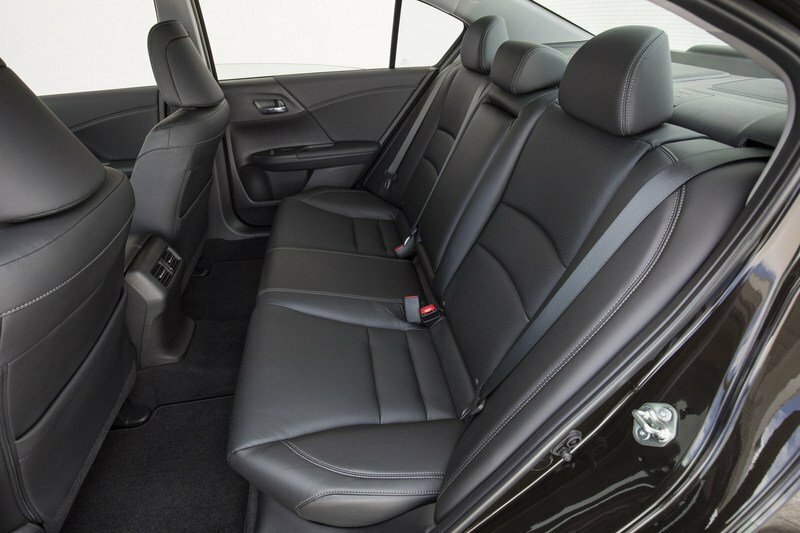 As far as comfort goes, the front seats have been completely re-engineered with improved ergonomics for maximum comfort and better lateral support to match the new Camry’s sportier dynamics. 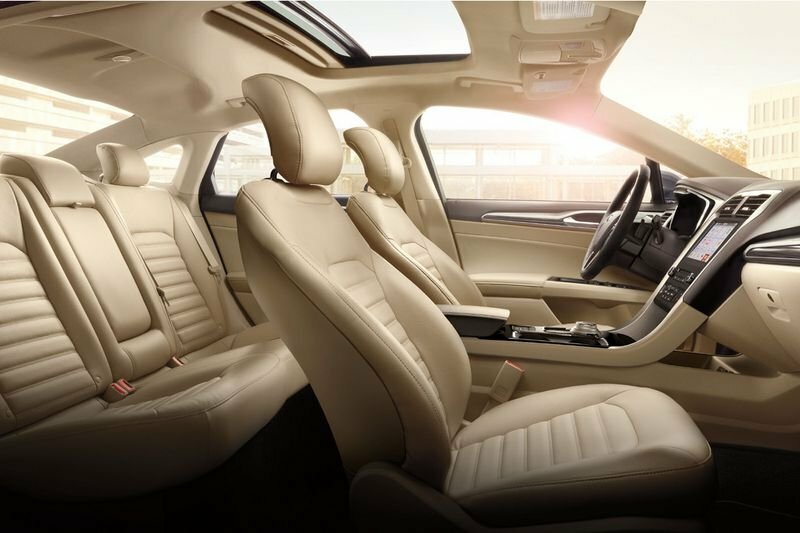 The rear seats also provide enhanced roominess and ergonomics. Speaking of which, passenger will have a lowered seating position in the new Camry, mainly due to the fact that Toyota didn’t want to sacrifice head and shoulder room by lowering the roof. The hood, cowl, and dashboard height have all been lowered to provide the driver with enhanced outward visibility. 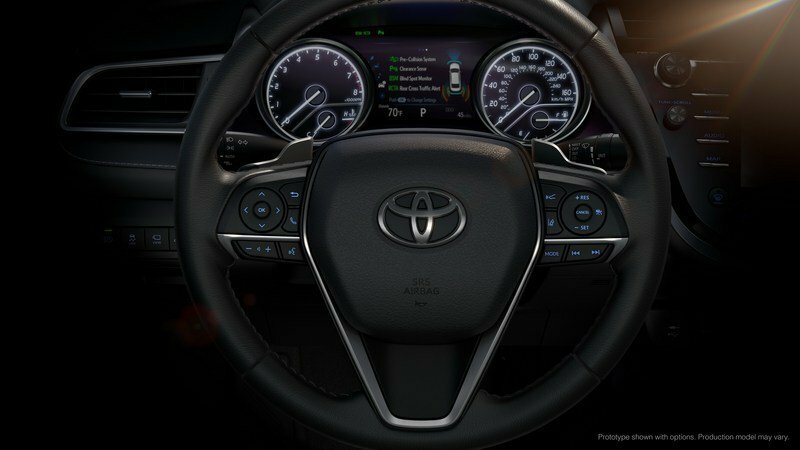 On the tech side, the new Camry comes with Toyota's latest Human Machine Interface (HMI). On the tech side, the new Camry comes with Toyota’s latest Human Machine Interface (HMI). 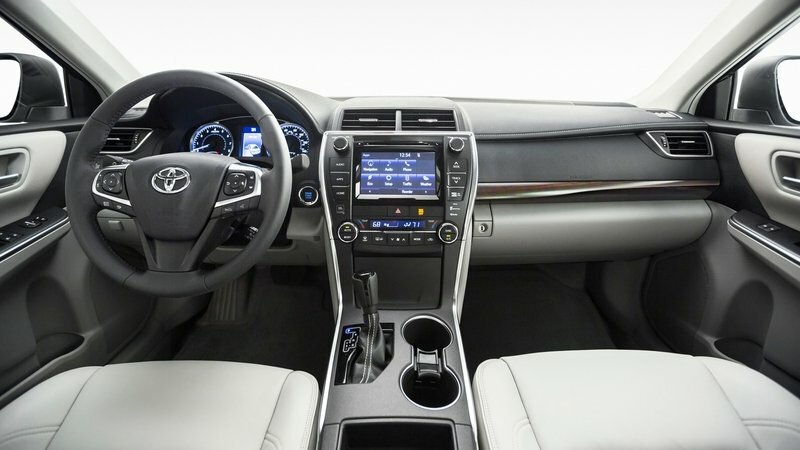 The system offers access to vital information through three interlinked displays, including a 10-inch heads-up display, a seven-inch screen in the instrument cluster, and an eight-inch infotainment display with navigation and air conditioning. The latter is integrated in the funky center stack. Toyota also offers new Entune 3.0 multimedia system on all models. Features include App Suite connect, Connected Navigation Scout GPS Link with Moving Maps on four-cylinder and hybrid models, while the V-6 also gets the new Dynamic Navigation system with improved map accuracy and wireless map updates. 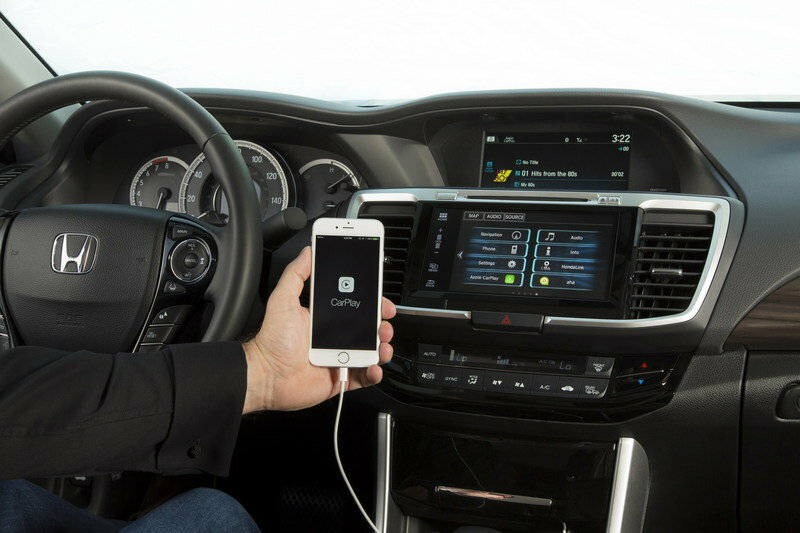 Other features include Remote Connect, which provides remote start and door unlock capability, vehicle status notifications, a guest driver monitor, and vehicle finder. Available Service Connect will provide up-to-date vehicle information on fuel level, maintenance alerts, and more. Entune 3.0 can also be optioned up with WiFi Connect, allowing up to five mobile devices to connect using 4G LTE. 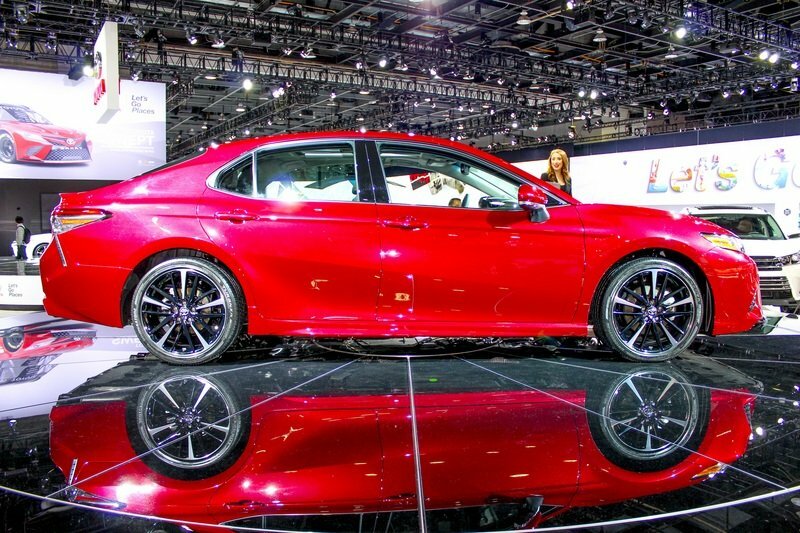 Finally, the 2018 Camry can be had with a JBL premium audio system with Sound Staging, which positions speakers directly in front of the listener to help emulate a live concert venue, Low Frequency Sounds via an added 10.1-inch subwoofer, and Clari-Fi, a technology that “un-compresses” music to help restore an audio track’s dynamic range. The Accord’s interior might not be as sporty as the Camry’s, but it has a straightforward, simple design that’s pleasing to the eye. The center stack is particularly interesting thanks to its multi-tier design. The main touchscreen flanked by A/C vents has been updated to a seven-inch unit, but it’s backed by the 7.7-inch display above. The A/C controls are placed below, along with a thin display. The upper screen provides access to audio settings, turn-by-turn directions, incoming calls, and parking sensors alerts. The lower display has GPS information and allows multiple gestures like swipes, pinches, and taps. All models come with the Multi-Angle Rearview Camera and Expanded View Driver’s Mirror, while the Touring trim gets auto high-beam headlamps, a first for the Accord. Apple CarPlay and Android Auto were also introduced on the latest model, but these feature come standard on EX and above trims. 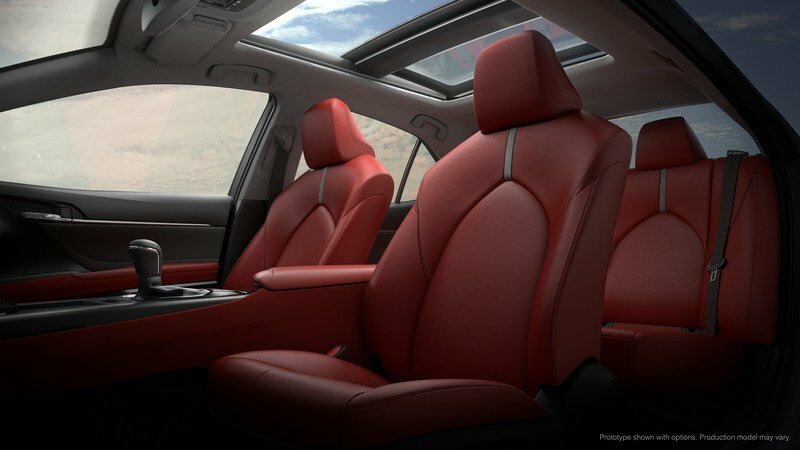 Better materials, more soft-touch surfaces, and new upholstery options round off the interior. The facelift didn’t change much in the Fusion, but the Ford has everything it needs to give the Camry a run for its money. The reconfingurable digital instrument cluster is a cool feature to have, while the thick-rimmed steering wheel adds a touch of sportiness to the front section. The center stack display might not be as advanced as Toyota’s new screen, but the SYNC3 system includes nearly all of the cars features, which results in a cleaner center console. The new rotary shift dial eliminates the shift lever and further reduces visual clutter. If you’re looking for a more premium interior, the Platinum trim adds antiqued leather on the dash and door panels and Venetian leather on the steering wheel. Driver aids include available pedestrian detection, hands-free parallel and perpendicular parking, Blind Spot Information with cross-traffic alert, and adaptive cruise control with stop-and-go. As far as dimensions go, a proper comparison is out of the question with no official specs from Toyota yet, but the table below shows that the Camry was behind its competitors in just about any department. It did provide a bit more rear headroom and rear legroom, but it was no match for the Accord and Fusion in terms of front passenger and driver room and cargo volume. This should change with the new-generation sedan. Although it was originally believed that Toyota will phase out the venerable 3.5-liter V-6 and opt for a turbocharged four-cylinder instead, the midsize sedan continues to use a naturally aspirated six-cylinder. The 2.5-liter four-cylinder was also kept, as was the hybrid drivetrain based on the same four-pot unit. However, all three drivetrains have been redesigned with a big focus on improving fuel economy. All three drivetrains have been redesigned with a big focus on improving fuel economy. Although specific figures aren’t yet available, Toyota says that the new 2.5-liter engine delivers more power and torque compared to its predecessor, all while returning lower fuel consumption. The latter is possible by achieving rapid combustion due to higher tumble air flow. Also, because of its long-stroke and high compression ratio, multi-hole direct fuel injectors, variable cooling system, and the latest version of Toyota’s Variable Valve-Timing-intelligent Electric (VVT-iE), the four-pot has a "world-leading thermal efficiency" of 40 percent. As far as fuel efficiency goes, Toyota anticipates that it will achieve best-in-class figures. The 2.5-liter mates to the newly developed Direct Shift eight-speed automatic transmission that provides direct-lock up from gears two through eight to eliminate power loss from the torque converter. The hybrid version is anticipated to achieve best-in-class fuel economy ratings. As far as output goes, expect the redesigned unit to generate significantly more than the 178 horsepower and 170 pound-feet coming from the outgoing engine. Moving over to the hybrid model, this system has also been engineered for more oomph, better fuel economy, and a more engaging driving experience. The latter isn’t just PR talk, as the hybrid’s Continuously Variable Transmission (CVT) features a new Sport Mode setting that allows the driver to execute smooth yet quick shifts on the simulated six-speed sequential shift transmission. The Sport Mode setting also improves acceleration and feel thanks to an electric power boost, while the battery pack has moved from the trunk to beneath the rear seat for a more balanced feel and precise steering. 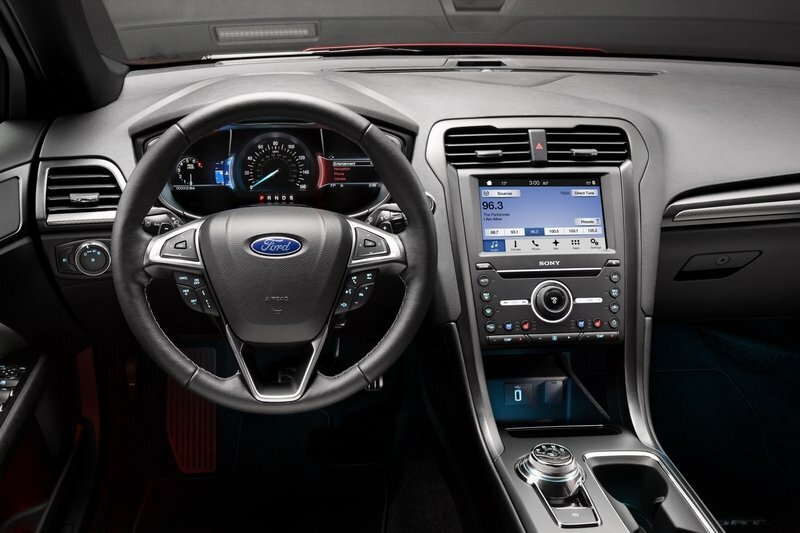 The hybrid can even be had with paddle shifters behind the steering wheel if you opt for the SE trim. 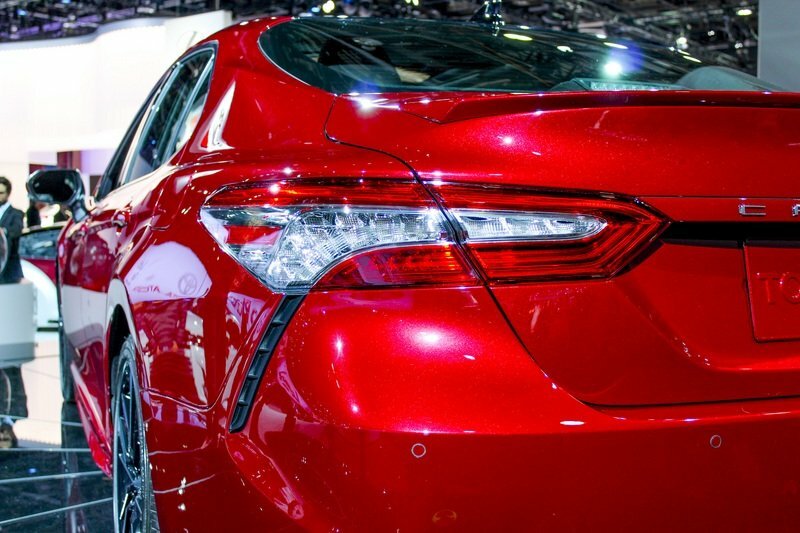 In addition to all of the above, the hybrid version of the new Camry is anticipated to achieve best-in-class fuel economy ratings, with Prius-like efficiency, which should be around 54 in the city and 50 mpg on the highway. Finally, there’s very little information about the 3.5-liter V-6, with Toyota only saying that it’s new and uses D-4S fuel injection. My best guess is that this unit shares most internals with the V-6 in the Highlander and Sienna models and will deliver at least 280 horsepower and 260 pound-feet of torque. 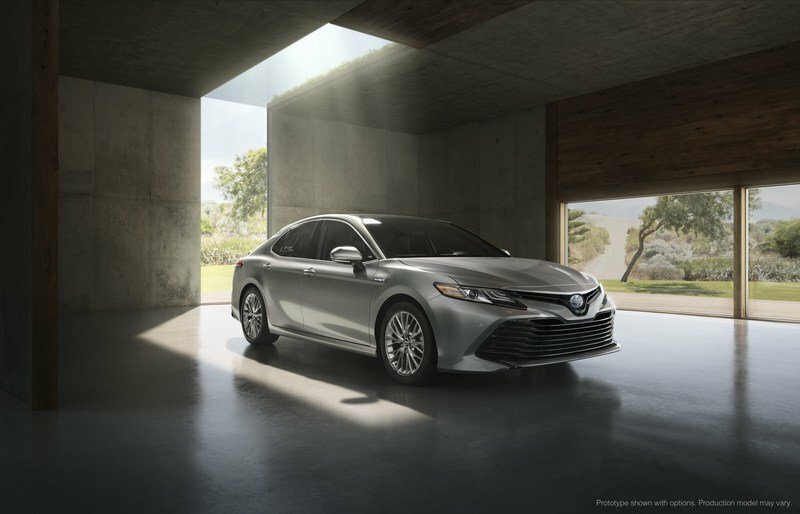 Fuel efficiency should also be superior to the outgoing model, so expect the new Camry V-6 to return more than 21 mpg in the city and 31 mpg on the highway. Note: Honda Accord engine pictured here. Despite the new exterior and cabin, the Accord didn’t get any drivetrain updates with its most recent refresh. The gasoline lineup includes two engines. 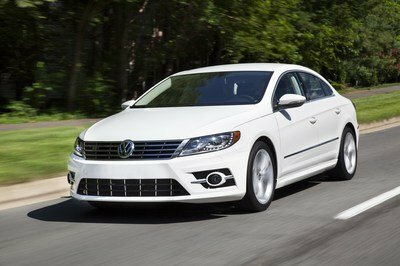 The base 2.4-liter four-cylinder cranks out 185 horsepower and 181 pound-feet of torque and comes standard in all but the range-topping EX-L V-6 trim. In the Sport model, the same unit generates 189 horses and 182 pound-feet. Moving over to the 3.5-liter V-6, it’s rated at 278 horsepower and 252 pound-feet of twist. Transmissions include a six-speed manual and a CVT for the four-cylinder engine and a six-speed automatic with Sport mode for the V-6. As for fuel economy, the four-pot returns up to 23 mpg in the city and 32 mpg on the highway with the manual gearbox and up to 27 mpg in the city and 36 mpg on the highway with the CVT. The V-6 and six-speed automatic combo is good for 21 mpg in the city and 33 mpg on the highway. The hybrid model combines a 2.0-liter four-cylinder with 143 horsepower and 129 pound-feet with an electric motor that generates 181 horse and 232 pound-feet. Total system output is rated at 212 horsepower, while fuel economy is estimated at 49 mpg in the city and 47 mpg on the highway. 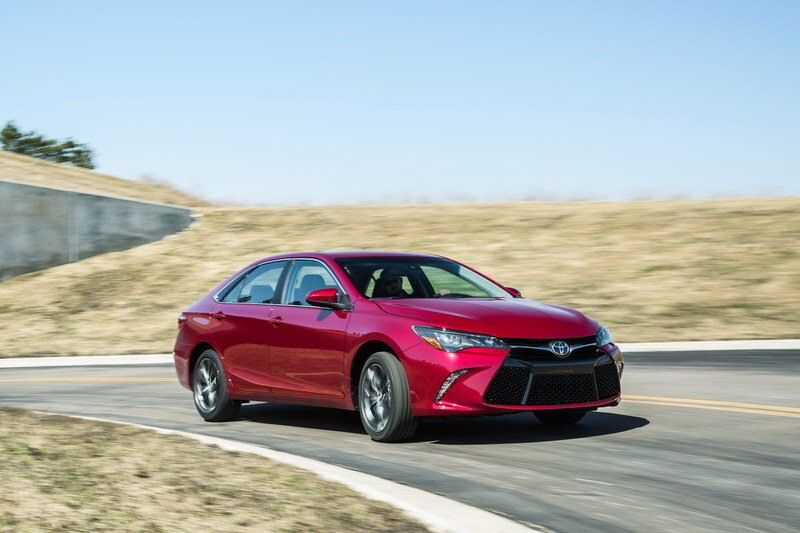 The mileage is definitely solid, but the Camry is expected to deliver better numbers. Note: Ford Fusion engine pictured here. Unlike its competitors, the Ford Fusion has many more drivetrain options, as the lineup includes four gasoline units and two hybrids. The base model is as old-school as they get, still using the naturally aspirated 2.5-liter Duratec four-pot. This unit cranks out 175 horsepower and 175 pound-feet of torque. The remaining options are all turbocharged. First on the list is a 1.5-liter EcoBoost good for 181 horses and 185 pound-feet, but you can also opt for the larger 2.0-liter EcoBoost with 245 horses and 275 pound-feet. Finally, the 2.7-liter EcoBoost V-6 pumps no fewer than 325 ponies and 380 pound-feet of twist in the Sport model. All these engines are paired to a six-speed manual and all but the base unit gets paddle shifters. 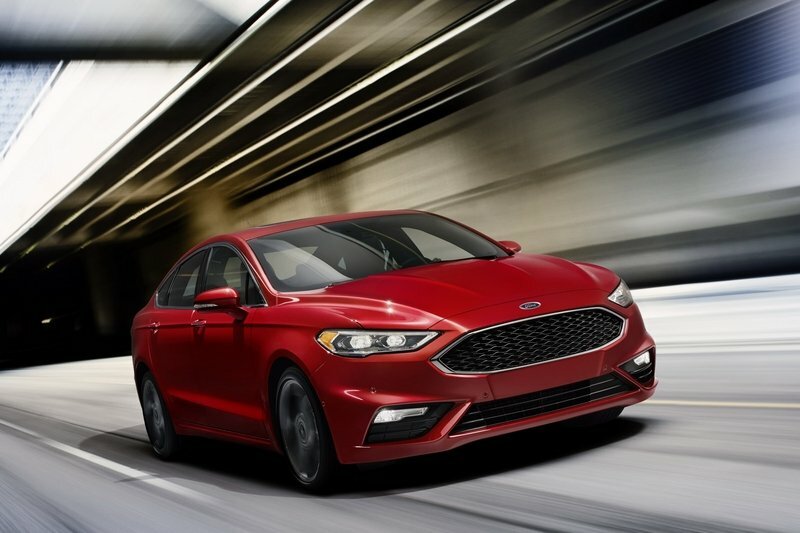 The Fusion can also be had as a hybrid and plug-in hybrid, both using a 2.0-liter Atkinson-cycle engine and an electric motor that generate 141 horsepower and 129 pound-feet of torque. Fuel economy is comparable to the Accord. 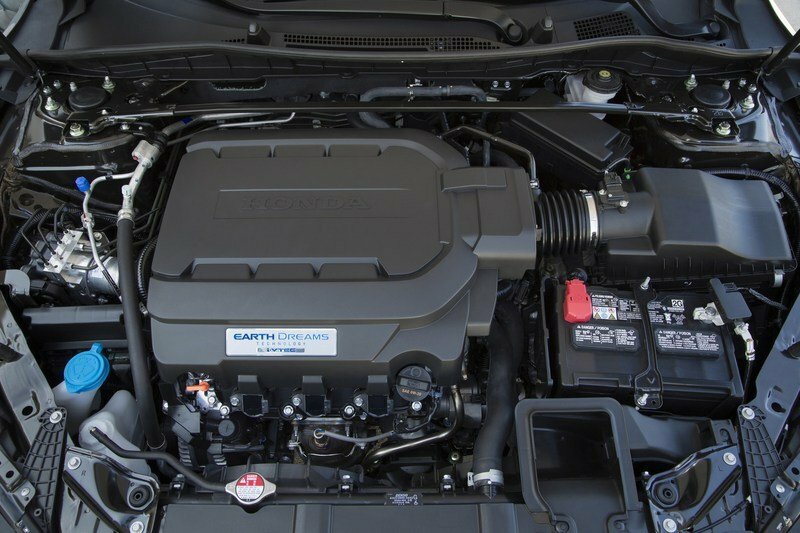 The base engine delivers 21 mpg in the city and 32 mpg on the highway, while the 1.5-liter comes in at 23 mpg in the city and 34 mpg on the highway. 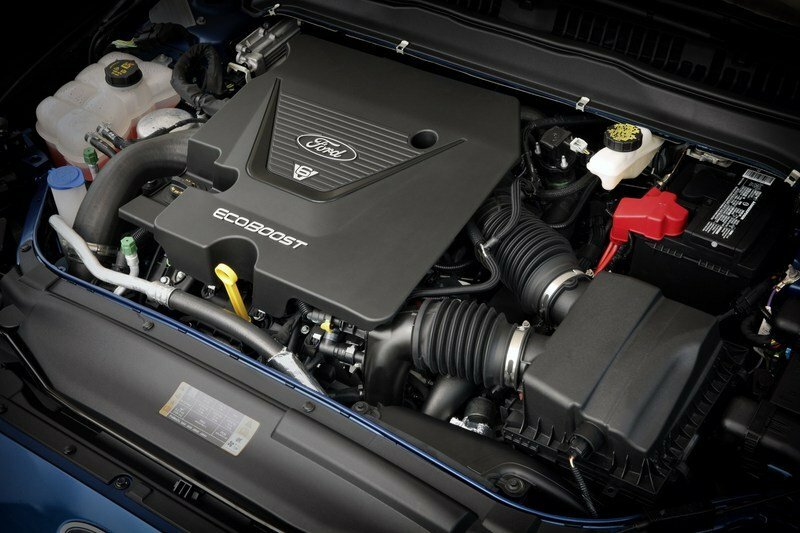 The larger 2.0-liter returns 21 mpg in the city and 31 mpg on the highway, while the performance EcoBoost V-6 is the least efficient at 17 mpg in the city and 26 mpg on the highway. Finally, the hybrids return 43 mpg in the city and 41 mpg on the highway, which is below both the Camry and Accord. There’s big news in the suspension department too, where the new TNGA architecture enabled Toyota to use a sportier setup. 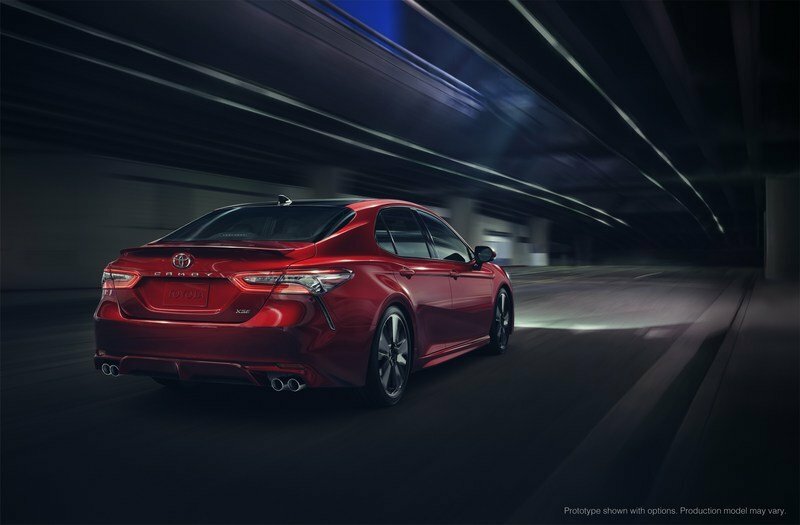 Specifically, the Camry rides on a new double wishbone rear suspension system that gives the chassis more responsive handling and precise steering, while also delivering a comfortable ride around the city. But the suspension setup is the only thing responsible for the sporty handling and enhanced ride quality. 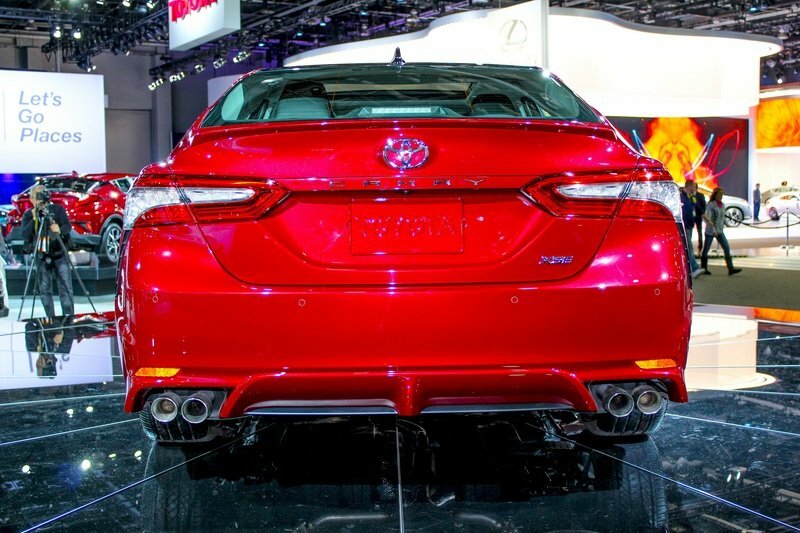 Toyota used significantly more ultra-high-tensile steel in this new chassis, thus increasing the Camry’s overall rigidity. 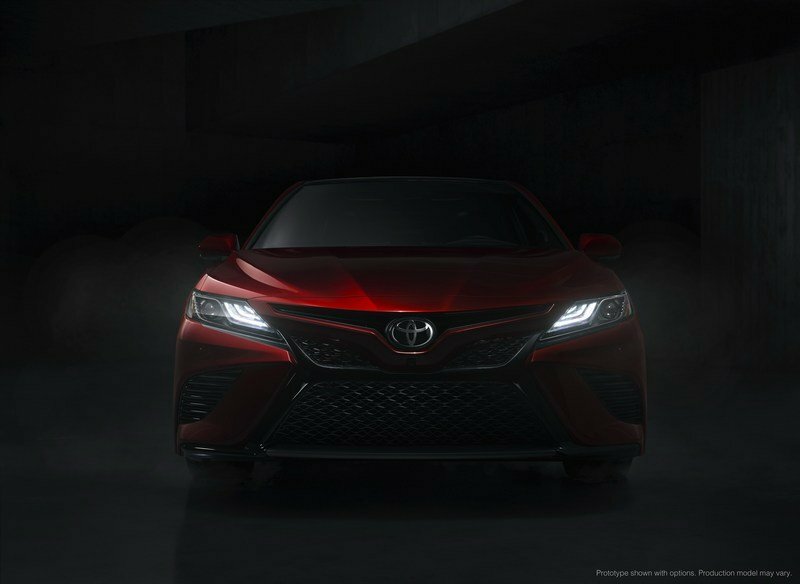 Toyota is so confident about the Camry’s new sporty ride that went as far as to say that drivers "will notice the dramatic improvements within the first few seconds of driving." 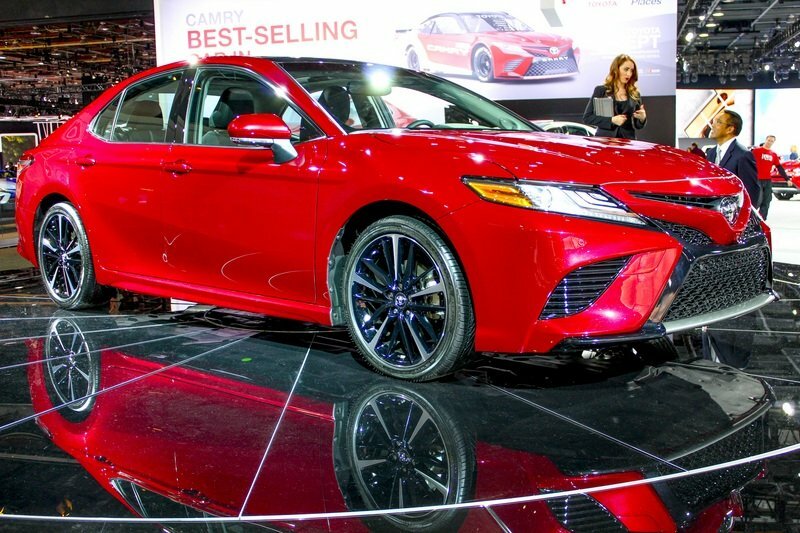 The new Camry is pretty solid in terms of safety, sporting 10 standard airbags and the company’s Star Safety System, which includes Enhanced Vehicle Stability Control, Traction Control, Electronic Brake-force Distribution, Brake Assist, Anti-lock Braking System, and Smart Stop Technology. The Toyota Safety Sense P (TSS-P) system also comes standard, adding a suite of active safety technologies. The bundle includes Pre-Collision System with Pedestrian Detection (PCS w/PD), Full-Speed Range Dynamic Radar Cruise Control (DRCC), Lane Departure Alert with Steering Assist (LDA w/SA), and Automatic High Beams (AHB). The more expensive trims feature standard Blind Spot Monitor (BSM) with Rear Cross Traffic Alert (RCTA). The Accord also comes with many standard safety features, starting with dual-stage front airbags, SmartVent front side airbags, and side curtain airbags with rollover sensor. The standard package also includes three-point seat belts with automatic tensioning system up front , seat-belt reminder, and child-proof rear door locks. Active safety system features include Vehicle Stability Assist with Traction Control, ABS, EBD, Brake Assist, and tire pressure monitoring. 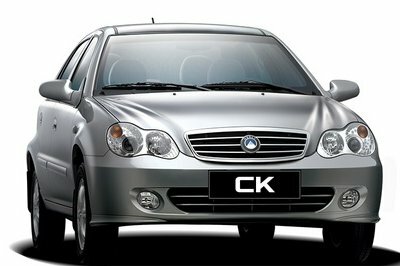 The Collision Mitigation Braking System and the Road Departure Mitigation System are optional. If you opt for the Fusion, you get standard dual-stage driver and front passenger airbags, front-seat side airbags, first- and second-row side curtain airbags, knee airbags for the driver and front passenger, and seat-belt pretensioners. There’s also individual tire pressure monitoring, AdvanceTrac with ESC, child safety locks for the rear doors, and SOS Post-Crash Alert. Optionally, Ford offers inflatable rear safety belts, a unique feature in this segment. As expected, pricing increased with the redesign, but the premium is only symbolic. Specifically, the new Camry retails from $23,495, which adds only $425 to the previous sticker. For this amount, you get the base L model, but an extra $505 will get you the LE trim at $24,000. Next up is the SE, priced from $25,000, while the XLE and XSE cost $28,450 and $29,000 before options, respectively. The XLE and XSE are highlighted by a sculpted rocker panel, new 19-inch black machined-finish alloy wheels (XSE only) a subtle rear spoiler lip, aggressive front bumper, and rear bumper with an integrated lower diffuser. 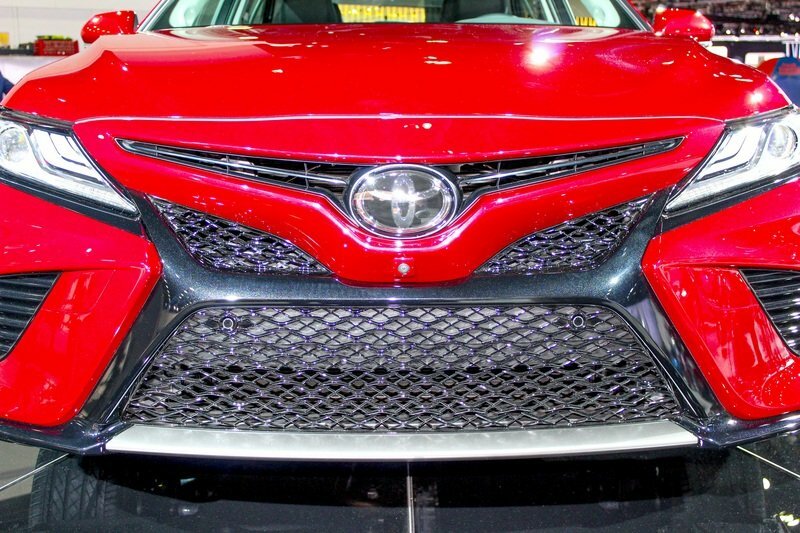 The front fascia sports larger side intakes flanking the lower bumper, a high and slim upper intake around the central Toyota badge, and a different mesh grille. 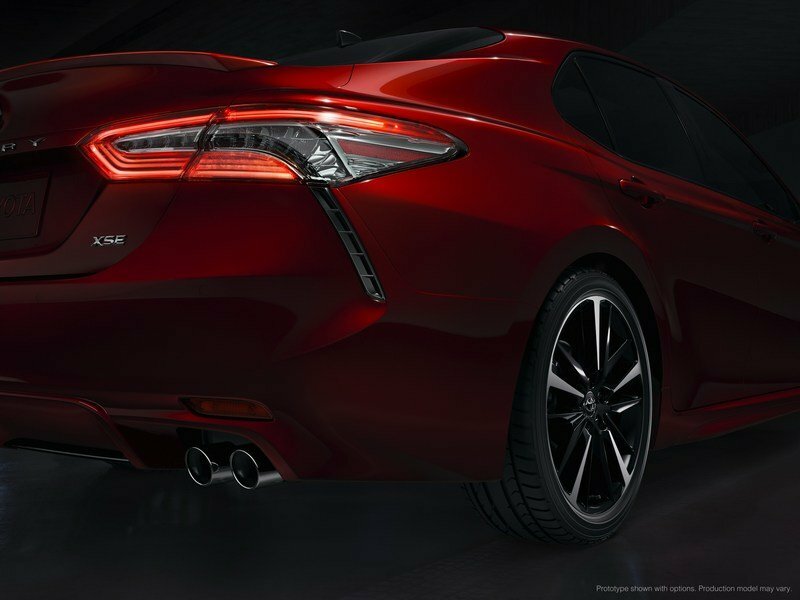 A revised rear bumper and smoke-tinted taillights round off the changes at the rear. Opting for the XLE with the V-6 engine increases the sticker to $34,400, while the XSE with the same engine starts from $34,950. Moving over to hybrid models, there’s three trim levels to choose from. The HV LE is the most affordable at $27,800, while the HV SE comes in at $29,500. Finally, there’s the HV XLE at $32,250 before options. 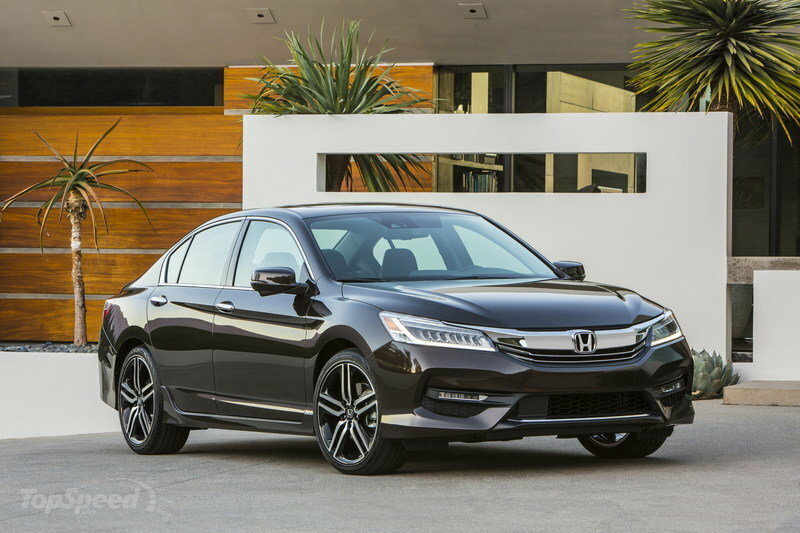 Pricing for the Honda Accord starts from $22,455 for the base LX model. Go with the Sport and the sticker jumps to $24,515, while the Sport Special Edition fetches $25,515 before options. The EX retails from $25,830, while EX-L goes from $28,920. Upgrade to the EX-L with the V-6 engine and you go into $30k territory with a sticker set at $30,955. The range-topping Touring model comes in at $34,930. The base Accord Hybrid retails from $29,605, but pricing increases to $32,905 for the EX-L and $35,955 for the Touring version. Moving over to the Fusion, it has a similar base price at $22,120. The SE costs $23,250 before options, but move up and you have to pay more than $30,000. Specifically, the Titanium is next at $30,250, while the Sport model costs a whopping $33,605. The Platinum trim is the most expensive with a sticker set at $36,750. 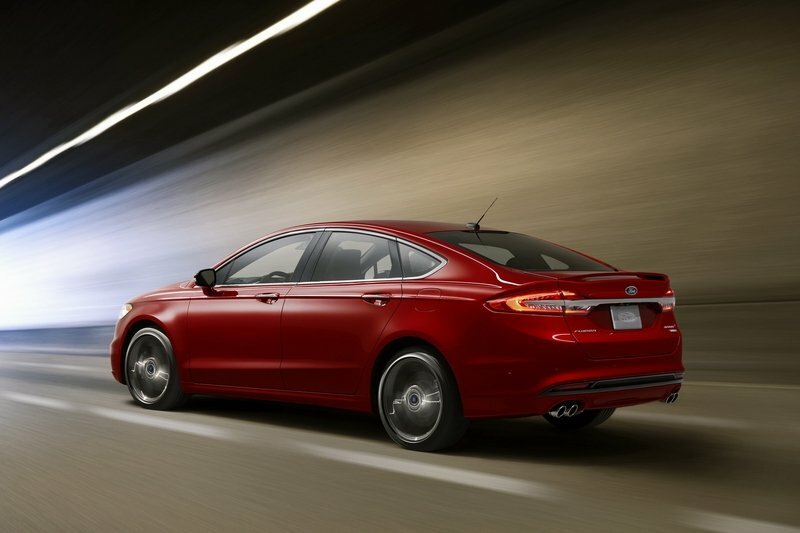 The Fusion Hybrid ranges between $25,295 for the base model and $37,130 for the Platinum version. If none of the options above seem appealing, perhaps the Hyundai Sonata is the midsize sedan you should get. 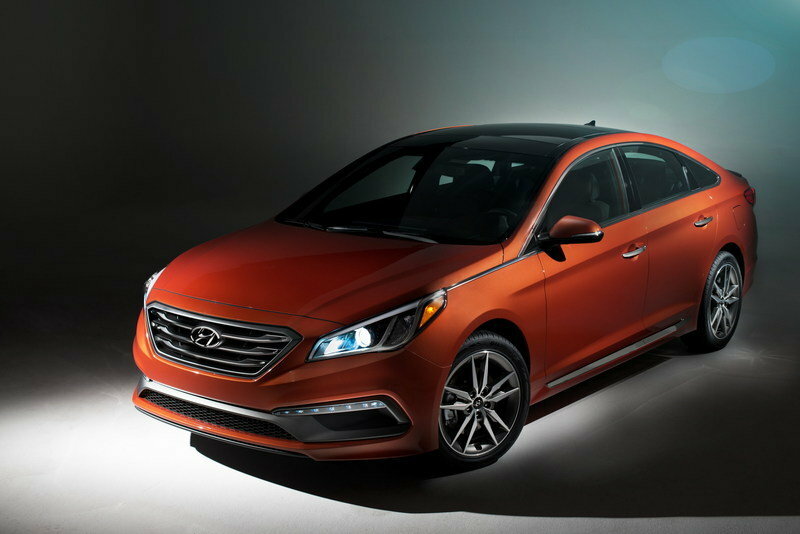 Redesigned for the 2015 model year, the Sonata isn’t as sporty as the Camry and Accord, but its design is fresh and in line with the company’s current styling language. Several engine options are available, starting with the naturally aspirated 2.4-liter four-cylinder good for 185 horsepower and 178 pound-feet of torque. More oomph comes from the smaller but turbocharged 1.6-liter four-pot, which cranks out 178 horses and 195 pound-feet. If more oomph is what you need, then you can go with the 2.0-liter turbo-four and its 245 horsepower and 260 pound-feet of twist. Transmission choices include a six-speed automatic and a seven-speed dual-clutch for the Eco model. Pricing starts from $21,950 for the base SE model and goes up to $34,350 for the Limited 2.0T version. Learn more about the Hyundai Sonata here. The Altima is yet another option that comes from Japan and runs for a similar sticker. The oldest model in this comparison, the fifth-generation Altima was introduced in 2012 and gained a significant facelift in 2015. It now has a sportier design that includes almost all of Nissan’s trademark cues, a well-appointed interior, and a selection of two engines. The base unit is a 2.5-liter four-cylinder rated at 179 horsepower and 177 pound-feet of torque, while the optional 3.5-liter V-6 cranks out 270 horses and 251 pound-feet of twist. 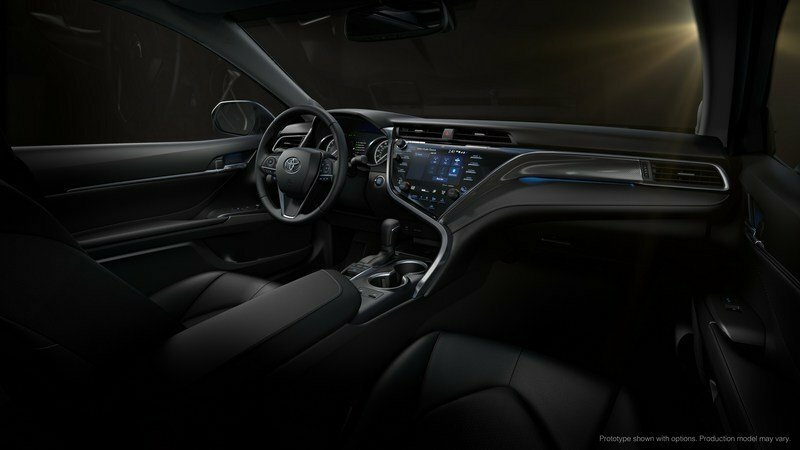 While its design might not be ground-breaking, the Altima comes with an important advantage in the fuel economy department. Specifically, the 2.5-liter four-pot returns up to 27 mpg city and 39 mpg highway, while the 3.5-liter V-6 is rated at 22 mpg city and 32 mpg highway. Pricing starts from 22,500 for the base Altima 2.5 trim, while the range-topping 3.5 SL retails from $32,690 before options. 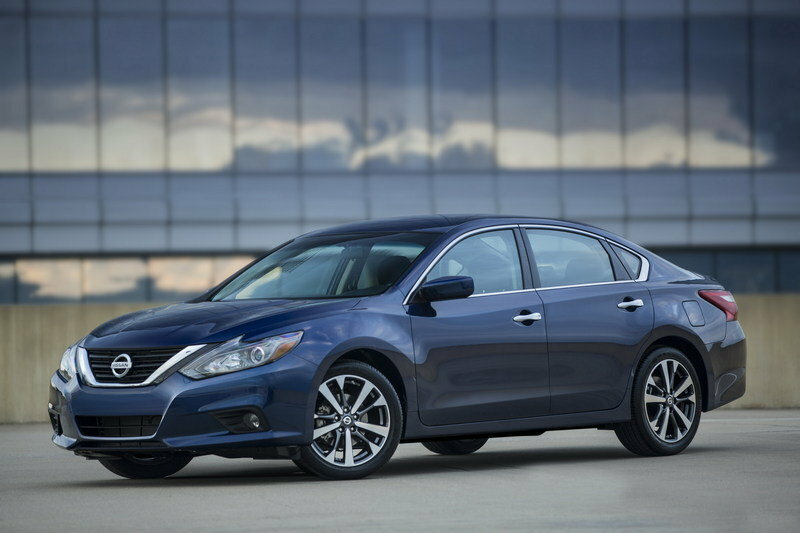 Find out more about the Nissan Altima here. The midsize sedan segment is one of the toughest here in the U.S. As seen above, there are four solid competitors to consider, but you can also add the Chevrolet Malibu and Kia Optima to the list, with more vehicles to consider if you dig deeper. The fact that the Camry has been the best-selling nameplate in this crowded market is amazing. 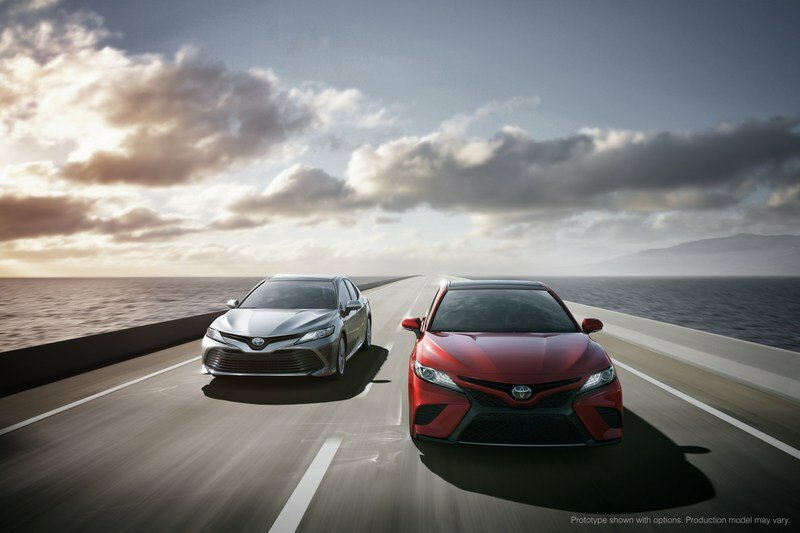 At the same time, it’s makes redesigning the Camry that much more difficult as customers (and the media too) are expecting a lot more from Toyota compared to other competitors. Being in the spotlight isn’t all fun and games. However, I think that Toyota did a tremendous job with the new Camry. 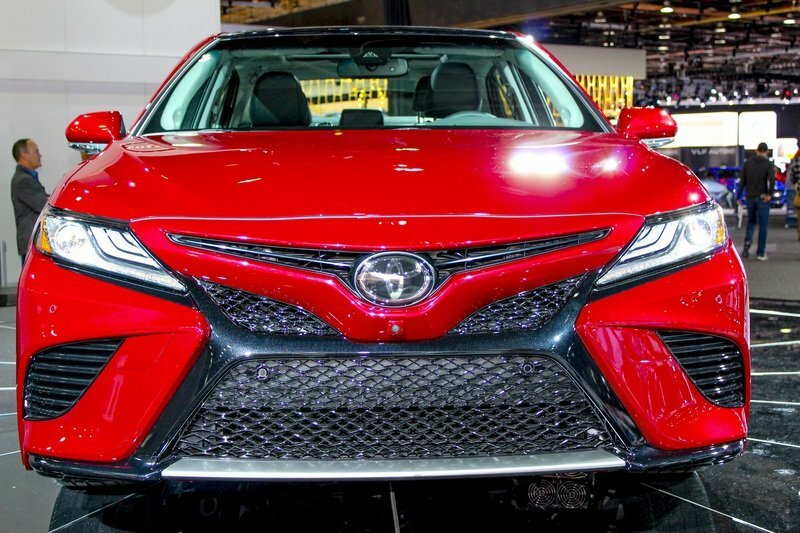 The eighth-generation sedan surpasses the expectations in just about any department and if the new engines are as powerful they need to be and return significantly better fuel economy, Toyota will have another winner on its hands. Combine all this with the rock-solid reliability the Camry is already famous for and this nameplate will continue to lead the market for years to come!